and stay up-to-date with all of our news. INFORMATION BOOKLET FOR ALL PARTICIPANTS FOR RACE WEEKEND! View our information booklet for race weekend here. NOTE: Courses are subject to slight modification. Very important: At about 9:45 (2 hours and 15 minutes after race start) we will ask that remaining half-marathon participants stay to the right side in the finish chute so that the runners in the marathon will be able to run on the left. This is for everyone’s safety, so please keep this in mind. There will be volunteers to remind you. Thank you! All Half Marathon participants will receive a technical t-shirt and goody bag at the Health & Fitness Expo on Saturday, March 30. NOTE: Mandatory Packet-Pickup is at the Health & Fitness Expo; there is NO Race Day Packet Pickup. 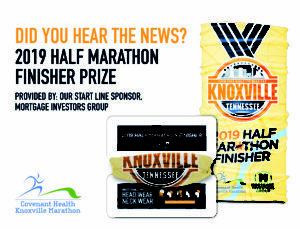 Half-Marathon finishers will also receive a finishers’ medal, a commemorative finishers’ buff sponsored by Mortgage Investors Group, and post race refreshments at the Pilot Flying J Post Race Party at World’s Fair Park. The half marathon course will feature 8 runner refreshment stations. Each station will be staffed with volunteers serving Powerade and Mountain Valley Spring Water. There will also be GU available at approximately the 6.3 mile mark. After finishing, be sure and join us for the Pilot Flying J Post-Race Party at World’s Fair Park! On Sunday March 31st, Dave Landeo & The Sol Beats will perform on the stage! Dave and Knoxville musicians Joe Thompson (sax), Michael Hulsey (trumpet), Vic Ilagan (drums) & Vince Ilagan (bass) will be performing on stage at the Festival Lawn at the World’s Fair Park from 9 am to 1 pm. The band performs a mixture of dance tunes, high energy rock, and soul pop covers and originals. It’ll be a big after-race celebration for all the runners, family & friends. Free and Open to the Public. At this year’s event, Calhoun’s Restaurant will be serving up beer from their world famous microbrewery, Smoky Mountain Brewery! They will serve beer on Saturday after the 5K (7 pm – 9:30 pm) and again on Sunday (10 am – 3 pm). Each registered participant, 21 and older, will receive a ticket for one complimentary beer. Calhoun’s will also be selling beer for family members, spectators, or participants wanting a second beer. (Participants under the age of 21 will not receive a beer ticket). We have arranged for Food Trucks to join us on both Saturday, March 30, and Sunday, March 31, including two of Knoxville’s favorites – Forks on the Road and Penne For Your Thoughts! They’ll be selling food to spectators, family members, or participants who are looking for more than the provided post-race food that comes with your entry. You will not want to miss this year’s post-race celebration! We have 30 great musical acts lined-up all over the marathon course! Dante Music Entertainment has recruited and coordinated live musical acts that will give you a feel for locally grown music and they’ll keep you moving. Click here to view the 2019 bands and their locations. Half Marathon participants must be 12 years of age or older. We recommend you be able to complete the course, whether running or walking, in 3.5 hours. The course will be rolled-up at a 16 min/mile pace. There is not a separate start time for walkers. We will have plenty of portable toilets. They will be near (but not right next to) every water station. There will be 5 at each of the first 6 water stations and then 4 at each of the remaining water stations thereafter. There will also be plenty available at the start, on both the concourse at the Knoxville Convention Center and the plaza terrace level of the KCC. Plenty of medical support will be available throughout the course, at the finish line, and at the Pilot Flying J Post Race Party. Mobile medical support units will be positioned every couple of miles along the course. There will be a first aid area after the finish line. Covenant Therapy Centers will aid in post-race stretching at the Pilot Post Race Party. The Covenant Health Knoxville Marathon has an Event Alert System. For more information about the EAS, please click here. Covenant Therapy Centers is proud to offer FREE Post Race Injury Clinics! If you have aches and pains after the race, be sure and be checked out by a Covenant Therapy Center sports injury professional. Click here for more information. Back for this year is the ability to participate as a team. The Half Marathon team competition is where each member of the team completes the 13.1 mile course. You may have as many people as you’d like on your team. For special team awards, only the top 3 participants on your team will score – their times will be combined for a team time (ALL participants are also timed individually and eligible for all individual awards and prizes.) There will be team categories for male only, female only, and co-ed teams. Teams can be any groups of people who want to add this designation (for free!) to their registration. Encourage others you know to join you in the race… coworkers, classmates, family, military, friends, etc. are all great ideas for teams. If you register as a team with coworkers, your team can also win the “Fittest Company” competition – determined by which company’s employees complete the most combined miles on race day. Fittest School Challenge Results are in! 2019 Fittest Company Challenge Results! Subscribe to our social media channels and stay up-to-date with all of our news. Covenant Health Knoxville Marathon © 2018 All rights reserved.Website built by T2 Design.